Brett arrives and Helen suggests they go and practise some Qigong outside. Debbie asks if they can do it in the back yard this time so none of her friends see them! Artie Goldberg, the manager of the Honey Pigs, arrives looking for Michael. He has an exciting proposition. Lou thinks perhaps they should store the homebrew elsewhere as Andrew MacKenzie was serious about them moving it. Doug says Andrew is barely out of high school but Lou points out that he is Doug's boss. Doug says it's a joke as Andrew doesn't know what needs doing. He locks up the shed to keep Andrew out. Michael comes round to tell Danni the Honey Pigs are coming to meet them tomorrow after reading the article in the Erinsborough News about him saving the cabbie. They are going to have their photo taken with them for the papers. Danni is thrilled. Cheryl is having an ultrasound tomorrow but is not worried about it. Lou double checks they were pulling the kids' legs about having a hippie wedding! Cheryl says of course. She knows Lou is all for convention and tradition; they're only getting married because he thinks it's so important. Lou asks if that means she doesn't really want to get married. Cheryl says she's been saying that for as long as she can remember but she will go through with it and will move out tomorrow. Lou asks if his proposal upset her. Cheryl says she felt she couldn't say no because she couldn't hurt him in public. Debbie is eating ice cream and quickly puts it back in the freezer as Helen and Brett come in from their Qigong session. Debbie leaves to take some more photos of the old house for her project. Helen is surprised that Brett doesn't go with her as she thought he was keen on Debbie. Brett says he still is, but she doesn't feel the same way. Helen tells Brett that he should be out having fun with people his own age instead of an old duck like her. Brett says he can talk to Helen; his friends don't understand his interests and he doesn't need them because he's got her. Cheryl has been thinking, and if she and Lou are going to get married she wants to do something different that will know everybody's socks off since they've both done the big white wedding before. She might ask the kids for ideas. Lou says they hardly seem interested, although it might get them involved. He senses something is wrong and Cheryl admits she is worried about the ultrasound. Debbie is taking photos when she spots Andrew MacKenzie doing some gardening. She takes some candid shots of him. Andrew takes his shirt off and pours water over his head and Debbie gets another snap! CHERYL: Danni, we have been waiting to get your attention to talk about our wedding and all you can talk about is what outfit you're going to wear to meet the Dirty Dogs! DANNI: The Honey Pigs, Mum! Cheryl and Lou ask Brett and Danni to help pick the wedding venue but they don't take it seriously and suggest things like a zoo, underwater, on a plane, a hot air balloon, or parachuting! Cheryl says she thinks they will go with one of those ideas but won't say which one! Michael is rehearsing Honey Pigs interview questions on Debbie but she tells him they're only using him for cheap publicity. 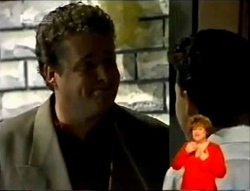 Michael heads over to the Starks and Helen suggests Debbie go too as Brett might like some company. 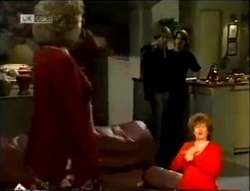 Debbie tells Helen to stop the matchmaking because she has got her eye on someone else. DEBBIE: I don't know his name yet but he would have to be the most perfect man I've ever seen in my life. Michael is reading something while Lou and Cheryl continue being deliberately secretive about the wedding to annoy Danni, who takes the bait. CHERYL: We wouldn't like to bother you with anything so trivial as our wedding. Now you just come right back here and continue to talk with Michael about the Honey Snaps! Danni sits back down on the couch with Michael who is impressed with the song she has written. Danni says she would like to be in a band. Cody compliments Debbie on her photos and comes across the shots of Andrew. Pam says it looks like she got more of him than the house! Cody teases Debbie about perving on him from a distance but Debbie says she was hardly going to go up to him as the overalls she was wearing make her look fat. DEBBIE: Anyway, what would I say to him? PAM: Hi, I'm Debbie… love your buns! PAM: Well, how do you think I picked up your father?! Cody suggests Doug may be able to introduce the guy to them and Debbie tells her to keep her hands off! Debbie leaves and Cody is heading straight for the building site! Cody arrives at the site and asks Doug about the guy Debbie saw but Doug says he doesn't have anyone of that description working for him. DOUG: Hey, maybe I'm the guy who's in those photos eh? CODY: Dad, we're looking for someone hunky, not… junky! Andrew comes on the scene and Cody tries to introduce herself but he is too busy ordering Doug to put back a wall that was part of the original house design. Cody has a go at Andrew because Doug has put a lot of work into the house and calls him an arrogant pig! Doug is annoyed with Cody for speaking like that to his boss. Cody says Debbie is welcome to him! The Honey Pigs arrive in a limo and are not impressed with suburbia! Artie tells them to be nice because they are getting some good publicity out of this. Mert hopes the chick is a “goer” and Artie tells him they don't need that kind of publicity. They enter the house and Artie introduces Dev, Chuck and Mert who take a seat and put their feet on the furniture. 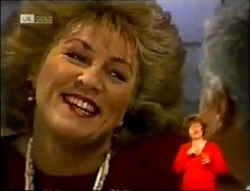 Helen offers afternoon tea and Mert dismisses her. Helen sarcastically tells them to make themselves at home. Michael says they couldn't believe it when Artie said they were touched by their story. Mert is sarcastic and Danni looks a little bewildered. Debbie and Cody have a cushion fight after Debbie learns Cody has been to see Andrew. Cody tells Debbie not to get excited as he is a jerk. Debbie thinks she is just trying to put her off but Cody assures her she wouldn't touch him with a 10- foot barge pole. Debbie arrives, pretending to be looking for Cody. Andrew comments on Debbie's school uniform and asks her if she's got any ideas as he has got to go around the local schools to raise funds for the council celebration. 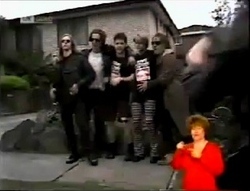 Debbie trips as she leaves. Doug is working on his car and tells Andrew he can't get the materials to put the wall back until he has fixed the car. Andrew says he hasn't come to have a go at him; he has done a good job on the house. He says they will work together from now on. Doug is still cool towards him until he asks if that homebrew in the shed is ready yet. Doug says no but there's plenty in the pub. Andrew says, “Let's go!” He tells Doug to call him Macca. Debbie and Michael are having pictures taken with the Honey Pigs while Pam and Cody look on. CODY: I didn't know it was going to be this big. 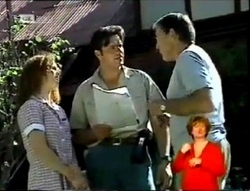 PAM: Oh yeah, of course Ramsay Street's going to be famous! Debbie comes along and tells Cody to check out Sassy being stopped by the police from getting closer. Sassy asks them to tell the cop she lives in the street but Cody says she's never seen her before in her life! 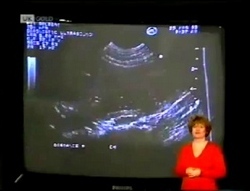 Lou and Cheryl are watching their ultrasound on video and Lou is convinced it's a boy. Cheryl is just pleased everything is OK.
Mert suggests Danni come back to his hotel for him to read over her song. Artie tells him to come along. Mert tries to bribe Danni to come with him by offering her his guitar. When Danni refuses, Artie takes the guitar off Mert and gives it to her anyway. Artie and Mert leave. DANNI: Good riddance to bad rubbish. They should just call themselves the Pigs! Helen doesn't understand how they could idolise such an obnoxious group and Michael says he doesn't anymore. Danni is not sure; she has got a guitar and an idea… she tells Michael they are going to form their own band!